Toyota's CX3 fighter should be expected in stores early next year and Toyota is saying it will stay close to the C-HR concept's ostentatious styling. The latest small CUV into the game is expected to debut at Geneva in March of 2016, based on Toyota New Global Architecture. Toyota claims that one of the larger benefits of TNGA is that it allows for enhanced interior space. Supposedly the Paris concept had similar interior space to Nissans Qashqai (now heading to NA) despite being somewhat smaller. New Toyota UK president Paul van der Burgh did say that “the high growth rate of sales of that sort of vehicle would be very good for us. The concept was excellent and the styling in particular stood out. If such a product were to launch, I’m confident it could be a best seller." I heard that it is going to be a Auris Cross. I know Toyota and Mazda has close relationship, any chance sharing the same frame ? We don't see much on this picture, but I pretty much like the front... and the wheels ! This is a link that just came up on my News Republic App about the Toyota or Scion Rival. What do you think about this Infiniti Q30? Looks like a CX-3?? I think only the main grille looks similar to the CX-3 and not much else. Or were you referring to it's specs? It has a slightly similar shape and flowing lines, but I think that it looks pretty unique. Really the QX30 will be the direct rival though. The QX30 will be a competitor of the MB GLA, BMW x1, Audi Q3 and Lexus NX. This means it will be prices low 30's to well over 40k. Way out of line to be a CX-3 competitor. mainemanx and Katrin Knauer Mellody like this. 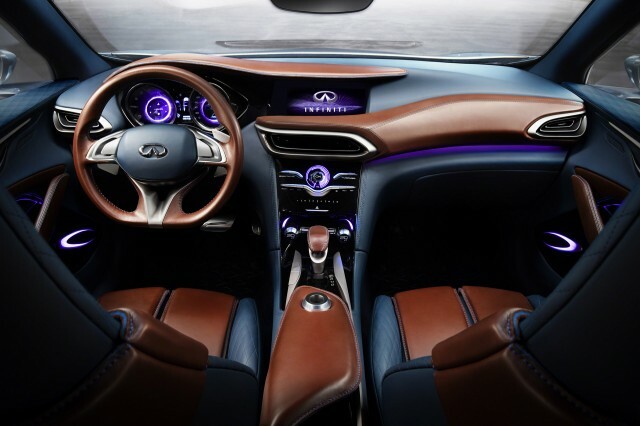 You see the interior of the QX30? Newer cars are getting ridiculous in their interiors and not in a good way. The interior lighting of the QX-3 reminds me of being in the back of a Las Vegas Limo. I look forward to the first company that peels away from this ridiculousness and makes a nice basic and clean interior that allows you the option to buy your own Infotainment system. I find myself missing the eruo cars of the late 90's early 2000's. Well if Toyota comes out with a competitor to the CX3 with larger interior and cargo space the current CX3 version could be in real trouble. While the ride handling in the CX3 is great something from a design point of view I have never really understood such as the tiny cargo area with no electric lift gate, lack of arm rest and electric park brake in the CX3. It seems such an obvious oversight by Mazda solely focusing on the drive but not paying attention to comfort and practicality. The problem with Toyota is their cars lack the fun driving experience and interiors look average compared to Mazda not to forget to get something decent with Toyota you have to fork out big dollars in the top of the range class of the selected car.